We spent part of the afternoon at the mortuary, dressing our girls for the first and last time. It had been a week since their birth, a week since we'd said our good-byes. But, there in that room in the mortuary, we realized that our good-byes from the week before weren't really final. Though their bodies are no longer united with their spirits, they are still very much with us. We included some special items in their casket. 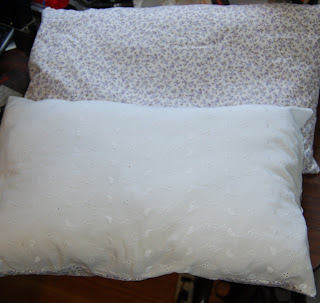 We made two matching pillows, one to lay their bodies on, and one for us to keep to remind us of them. 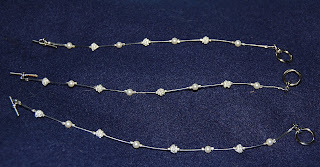 I also made two matching necklaces for Elliana and Emmaline, and a matching bracelet for me. We wrapped their bodies in a blanket my Mom had crocheted, and covered them in a blanket that my sister-in-law made. We put some notes and letters in with them, too. 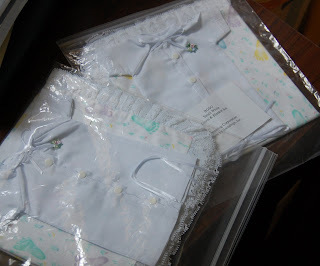 *these are the dresses the hospital sent us home with, for our girls. *the matching necklaces and bracelet. When dreams and plans had been snatched away? That her sibling might live and stay. To give us life and make us one. Angel twins that beckon us. What a special time for you and Marc. And one that will always remind you of your beautiful little girls. I have been thinking of you so much lately. Just know you are continually in my thoughts and prayers. Thanks again for sharing your experience. It helps. Tears fill my eyes as I read your blog. Yet they are tears of joy knowing that someday I will see my other twin. God's Love and prayer to you and yours during this difficult time.